Don't worry - TQ Diamonds is here to help! 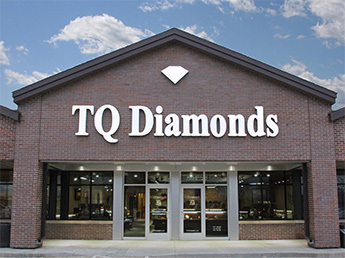 TQ Diamonds, located in the heart of the Midwest (Madison, Wisconsin), is pleased to offer eyeglass and sunglass repair with the advanced technology of our laser welder. 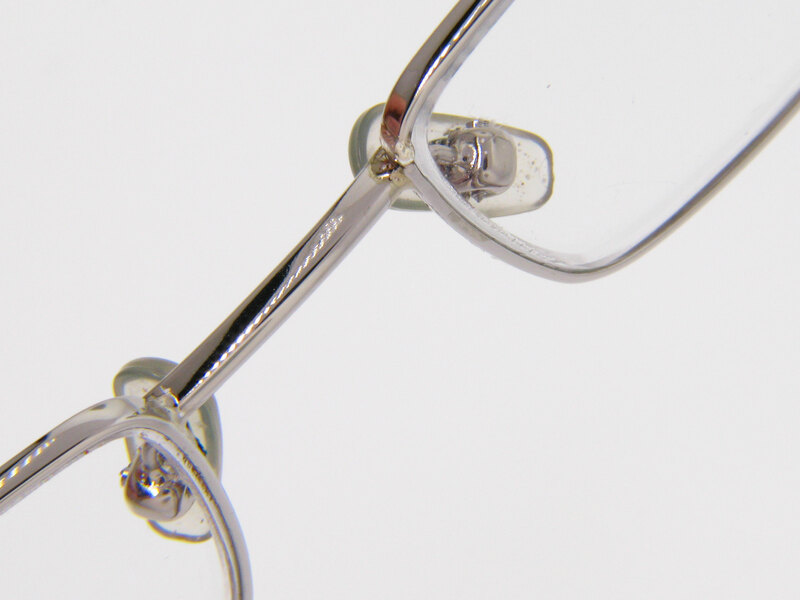 Since 2003, we have fixed thousands of eyeglass frames with a 99% success rate. The Laser Welder can repair virtually any break on almost any type of metal, including Titanium. With this awesome new technology, solder and a torch are no longer needed. The Laser simply shoots a beam of light, which actually welds the two pieces together producing little to no heat. A filler of gold, platinum, silver or titanium wire is then used in the Laser to fill the groove where the two broken pieces were joined. A laser weld is eighty-six percent stronger than a traditional solder. 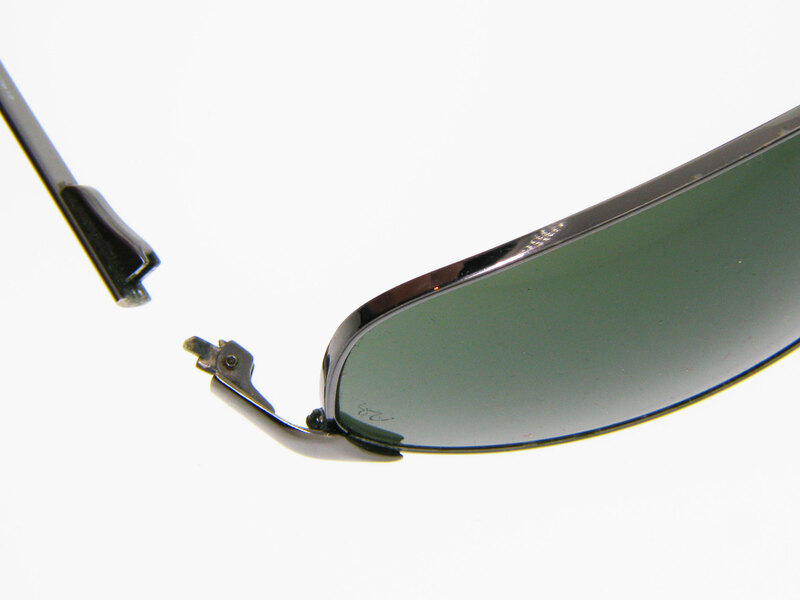 In addition, with the laser, TQ Diamonds can fix breaks that wouldn't be possible with solder, such as Titanium (which cannot take heat), glasses that have a finish, or glasses with a plastic bottom to hold the lens in place. We are now offering mail-in repairs so that we can service you no matter where you're located! With skilled laser technicians working 6 days per week, we are able to offer same day shipping if we receive your glasses by noon. 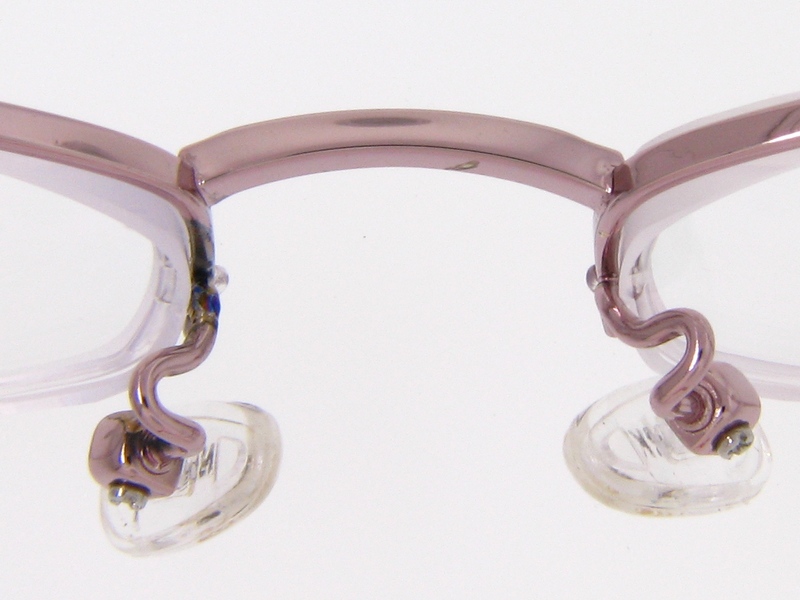 At just $45 with free shipping, this is definitely less expensive than getting new glasses! In addition, we give you a 30-day warranty on the weld. 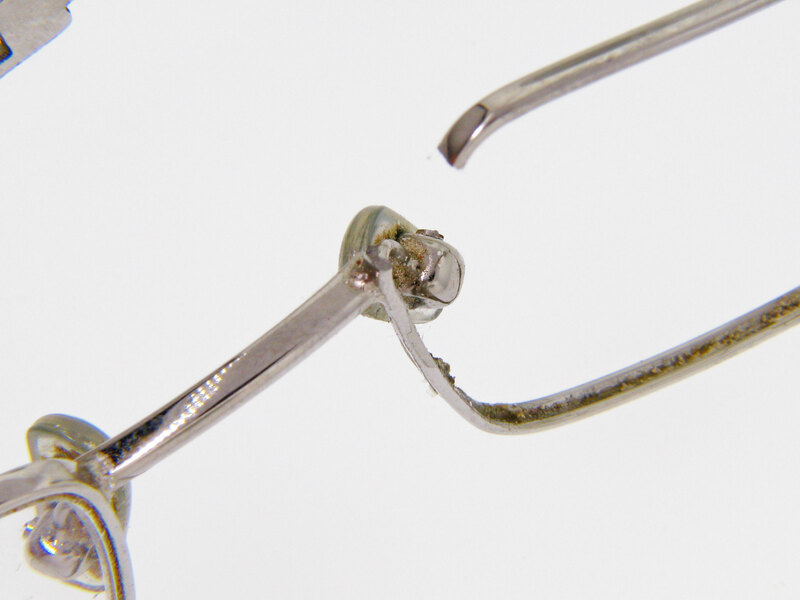 If it doesn't hold, simply send your glasses back to us for a second repair. We will send your glasses back via USPS First Class Mail at our own expense. We do not provide insurance, but offer it to you for an additional cost. Please refer to the order form for insurance pricing. 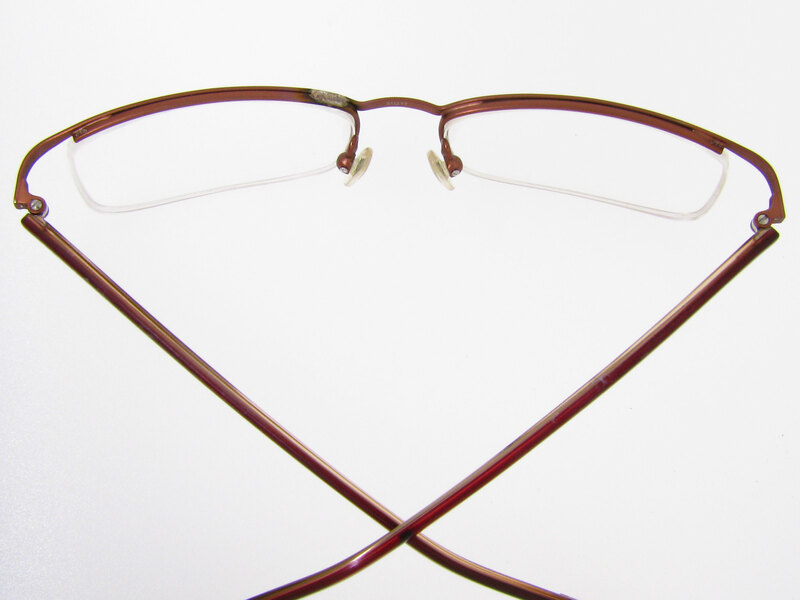 Since eyeglasses are generally very expensive items, we highly recommend that you insure your package! We are not responsible for glasses that are lost or broken in the mail. Join the thousands of happy customers who can SEE without replacing their expensive eyewear! Just click on the link to print out the form , fill it out, and send it along with your eyeglasses. We'll take care of the rest! Laser is an acronym for "Light Amplification by the Stimulated Emission of Radiation" which produces a sharp, focused light beam that melts a very small area of metal. The benefit of this technology is that very little heat is generated at the weld point, allowing users to easily weld .5 to 1.0mm (.020" - .040") away from the most complicated and intricate component parts without damaging heat sensitive materials. Operators hold parts in their hands while viewing the application through a stereo-microscope in the welding chamber. Internal cross-hair allows the operator to easily align and weld the parts at the correct location. 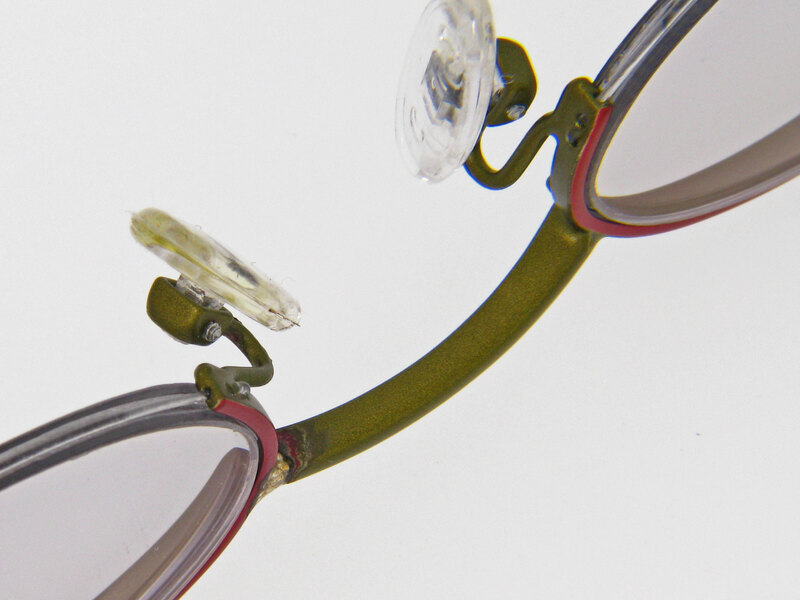 Laser welding is ideal for a wide range of eyewear repair applications. Fast, clean and considerably stronger than a traditional solder joint, laser welding produces damage-free results with minimal discoloration. 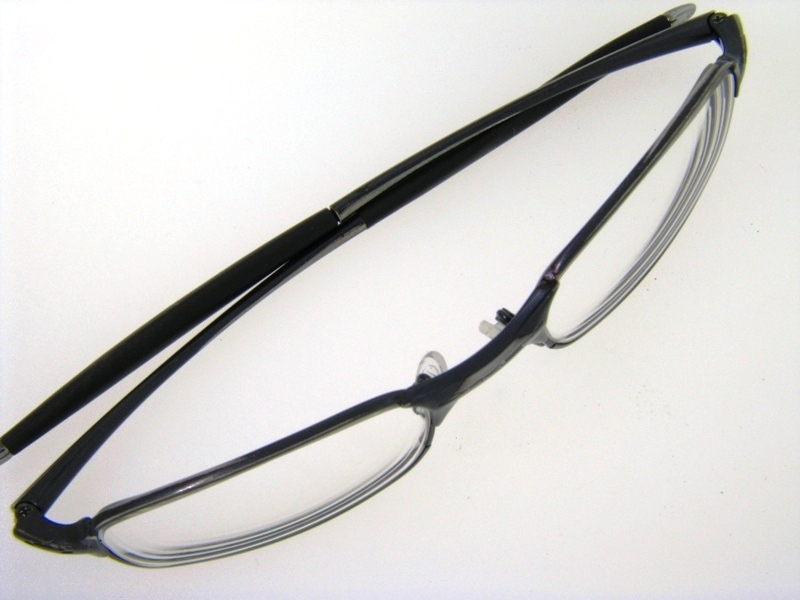 - Effective on all metal frames including: Titanium, Gold, Stainless Steel and Flexon. - Repair temple hinges, spring hinges, riveted hinges, hidden hinges, etc. - Repair bridges, pad arms, eye wire barrels, end pieces, modify temple length. - Replace pad arm assemblies, temples, unit bridge assemblies, etc. 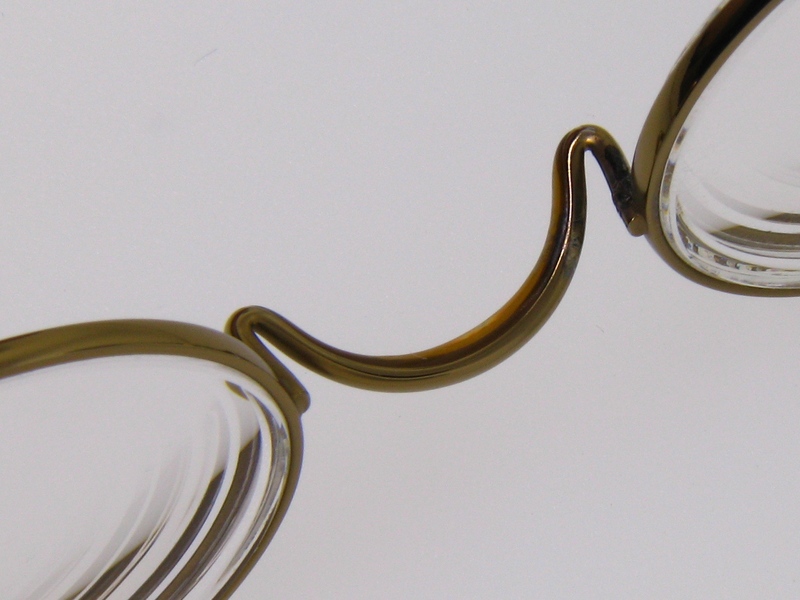 Can a jewelry store fix my glasses? 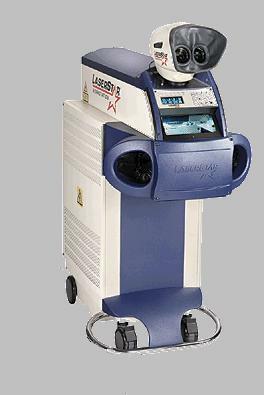 Most jewelry stores don't own a laser welder because of the cost of the machine is over $30,000 or employ qualified Laser Technicians that will be skilled in fixing your glasses. Can an optical store fix my glasses? 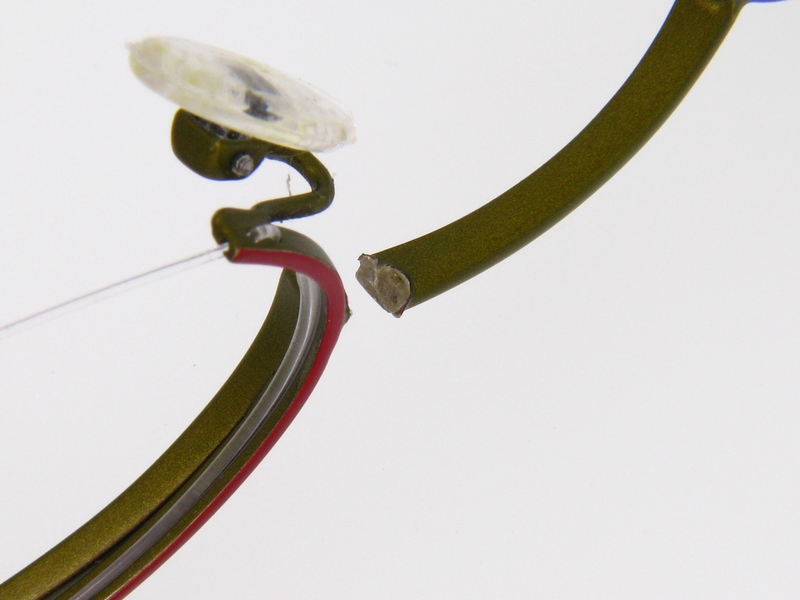 Most optical stores do not have the necessary technology to fix broken frames. They can bend twisted frames or reattach screws, but they do not have anything to fuse metal parts together. We get most of our in-store repair customers through optical shop referrals! 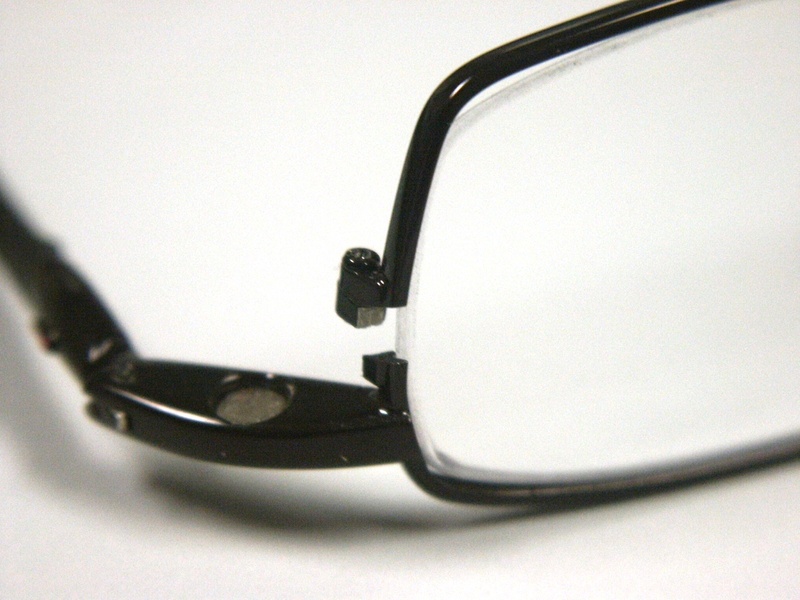 Can you fix eyeglasses with magnets for clip-ons? Yes. Unlike torch heat, laser welding will not damage the magnets in your clip-ons. Can you fix my eyeglasses? 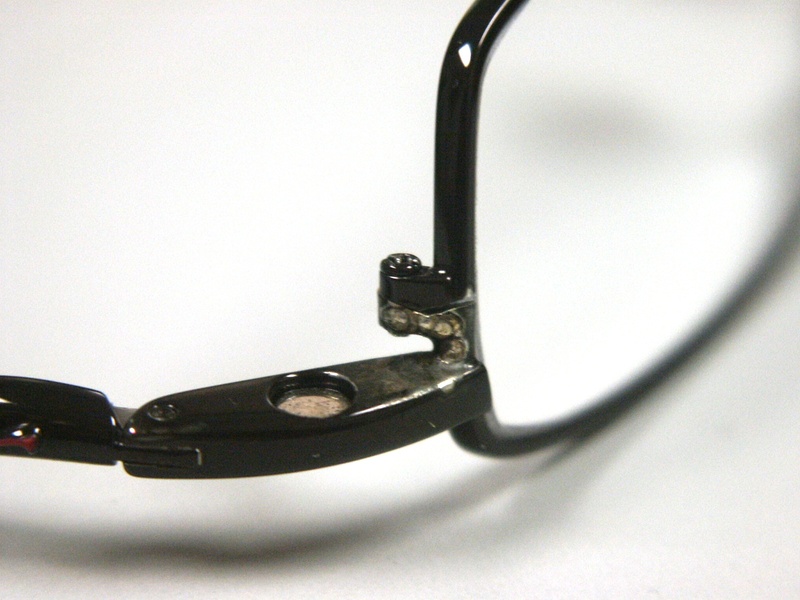 Yes, we have a laser welder that can repair most metal eyeglass frames including titanium. Yes. If they are metal frames or if the break is at a metal hinge. Do I need to make an appointment to have my eyeglasses fixed? No appointment is needed, just stop in. 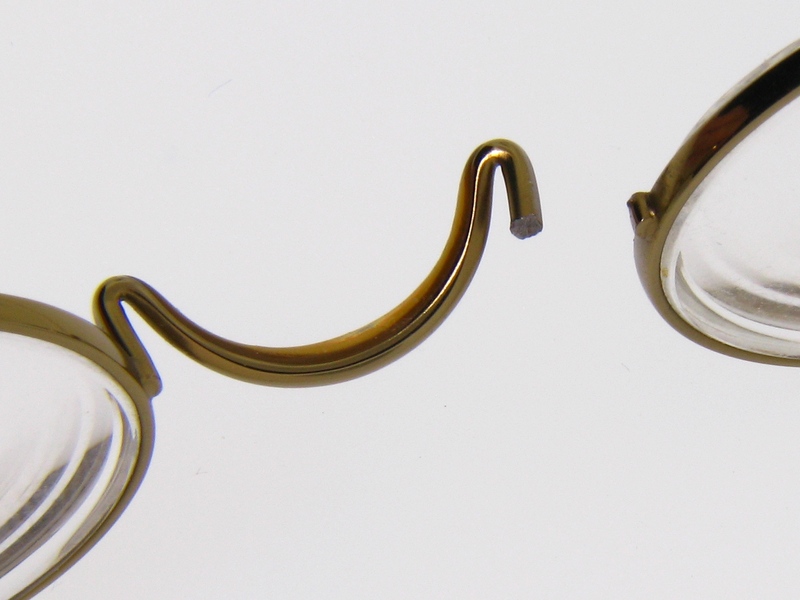 Do you offer a warranty on laser welding eyeglasses? Yes! We offer a 30-day warranty. We have a 99% success ratio the first time. 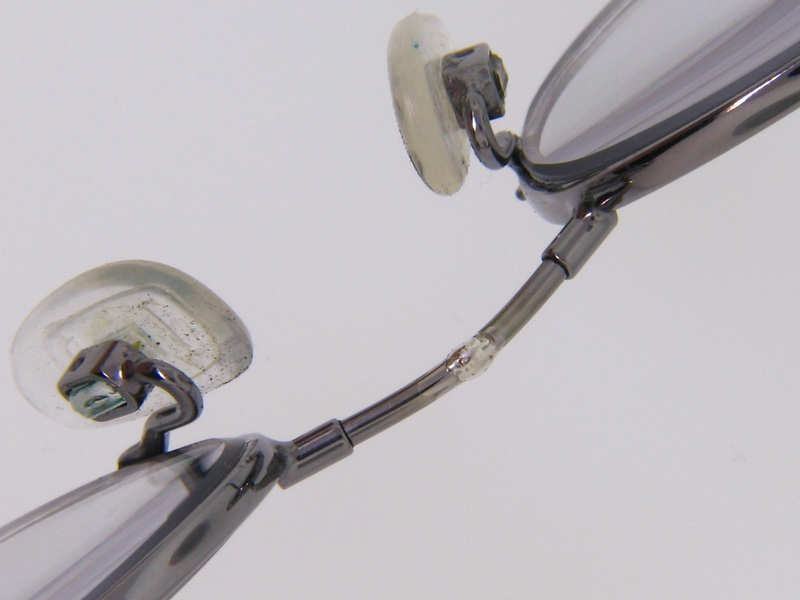 We have successfully repaired thousands of eyeglass frames for clients just like you. How do I know if my frames are titanium? 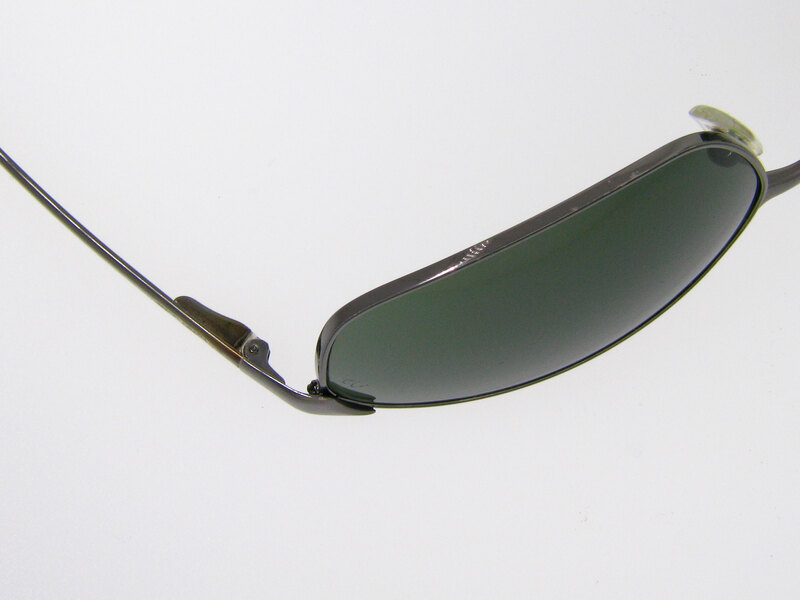 Most designer glasses are made from titanium alloys. 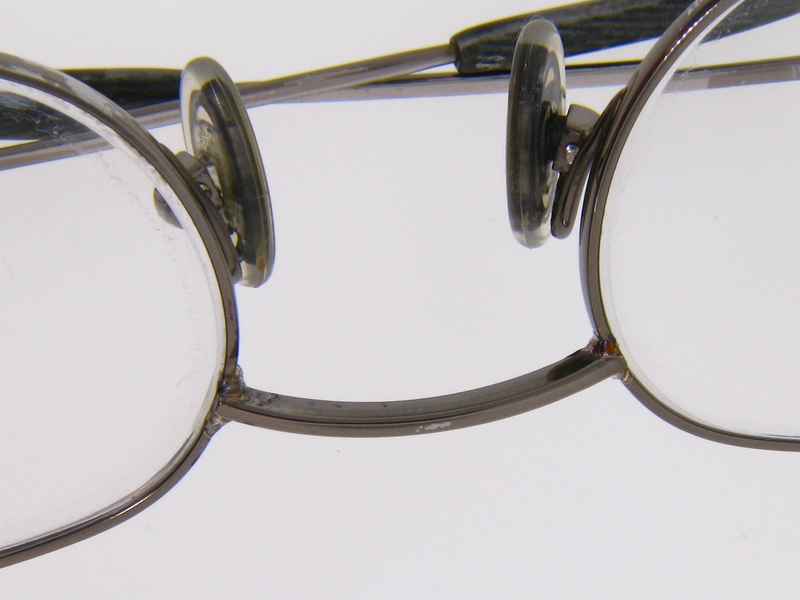 If the frames are very light and thin, the odds are that they are titanium. How long will it take to laser weld/repair my eyeglasses? If you visit our store, a repair typically takes 30 minutes. If you mail in your frames and we receive them by Noon, we will have them mailed out by 4pm the same day. We use USPS First Class Mail, which will typically arrive in 3-5 days, depending on where you are located. If you would like to upgrade to Priority (2-3 days) or Express Mail (1-day), you may do so for an additional charge. 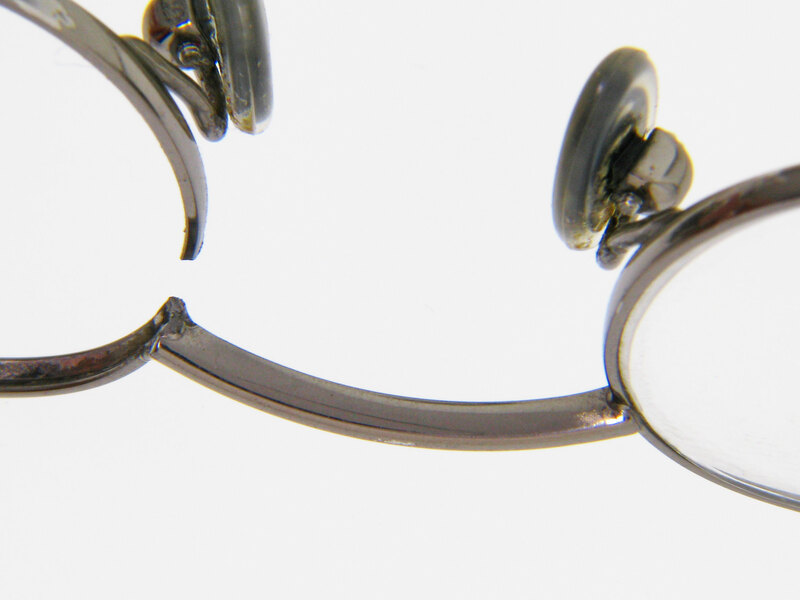 How long will it take to repair my eyeglasses? 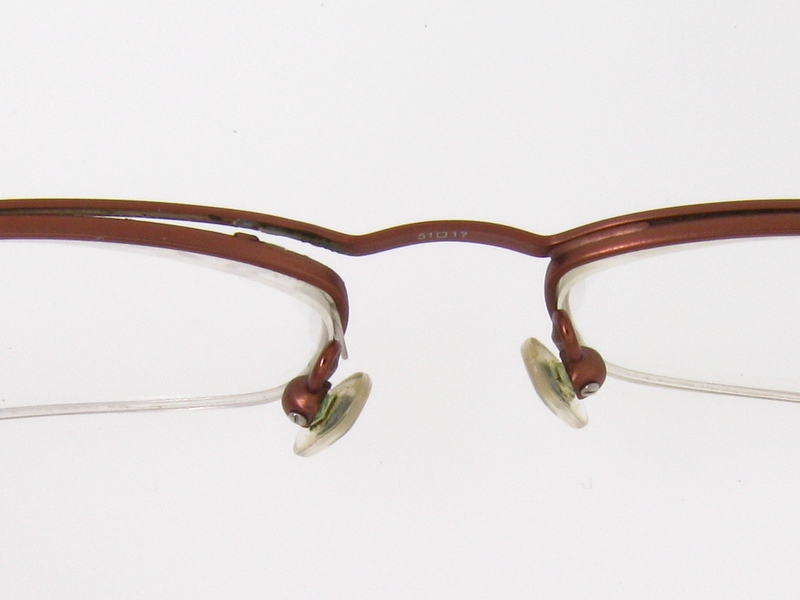 Eyeglasses are repaired usually while you wait within 30-45 minutes. 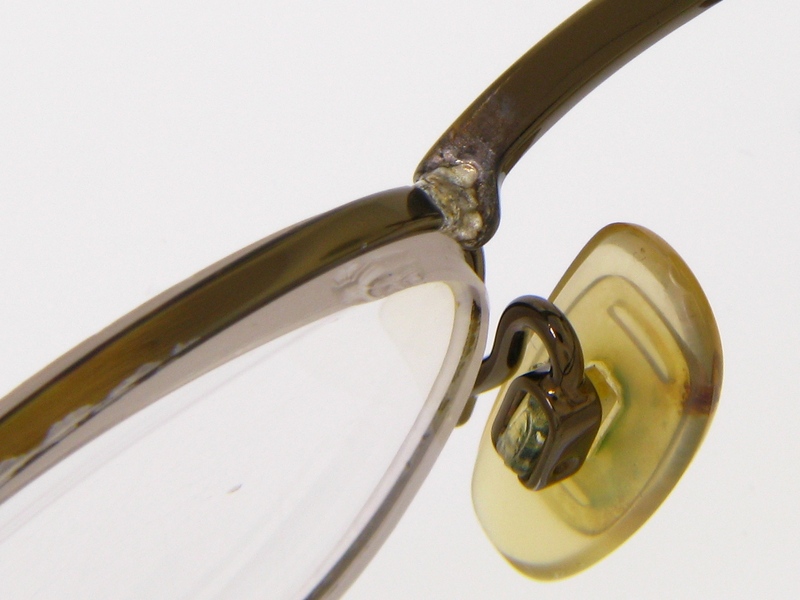 How much does it cost to repair eyeglasses? 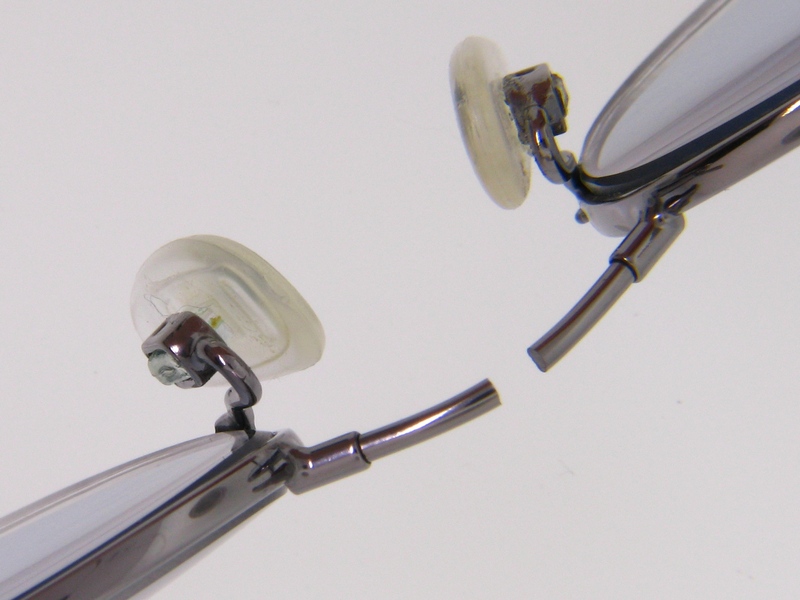 A typical eyeglass repair is $45 and comes with a 30-day warranty. I tried to repair my glasses with solder, but they broke again. Can they still be repaired? Yes. However, we need to spend extra time completely grinding off the solder from your frame, there may be an additional charge. I tried to repair my glasses with super glue, but they broke again. Can they still be repaired? Yes. However, since we need to completely remove the contaminant before welding, there may be an additional charge. If I have a missing piece (like a nose pad or bow), can you replace it? No. We do not have any pieces to supply. If you have the broken pieces, we can weld them! If my plastic frames are broken at the hinge, can they be repaired? 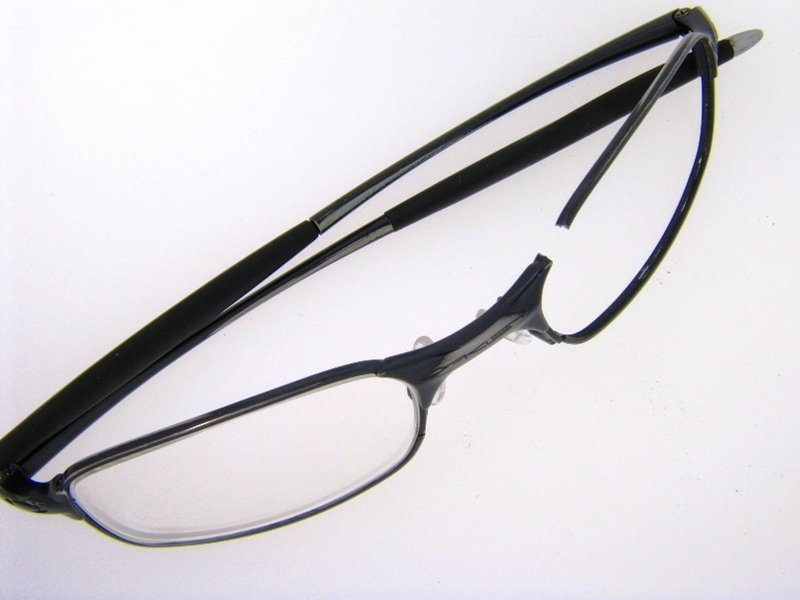 Plastic frames often have metal hinges, and are usually able to be repaired. Is laser welding stronger than soldering? Yes. Laser welds are 86% stronger than a traditional solder bond. This is because laser welding only uses pure gold, silver, platinum or titanium as filler metals, whereas solder uses nickel and copper. Oftentimes, because of the tendency to apply quick spot welds during manufacturing, the laser weld is even stronger than the original frame was! Yes. Laser welding allows us to join two different metals together, including gold. Should I send my glasses case along with my frames and lenses? For the safety of your frames, it would be appreciated, but it's not necessary. Whether you're sending your case or not, please take care to wrap all items (especially your lenses!) in tissue, bubble wrap, or other packing materials so that nothing is damaged in transit. Should I send my lenses? Someone told me that they could repair my titanium frames with a torch. Is that true? No. Oxygen in the flame corrodes and oxidizes the metal causing the titanium to become brittle. The only way to properly repair titanium or titanium alloy frames is with a laser welder in an oxygen free environment with the use of Argon gas. Someone tried to fix my titanium frames with a torch and they broke. Can they still be repaired? No, not usually. When fire is applied to titanium, the metal can become too brittle to repair. Will the repair be noticeable? No. Most of the time, aside from a very small area around the break of discoloration, the repair is unnoticeable. Laser welding your eyeglasses is very affordable, especially when compared to the cost of purchasing new frames and lenses. If you are not from the Madison, Wisconsin area and cannot visit our location in person, you can mail your eyeglasses or sunglasses to us. If we receive your eyeglasses by Noon (Monday-Friday), we will mail them back to you by 4 p.m. on the same day! You can pay online here! Please e-mail us with questions. 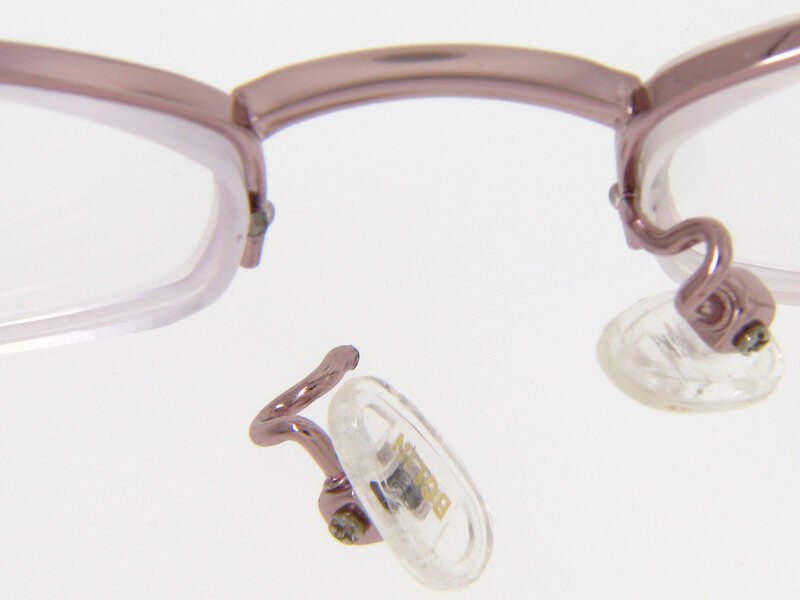 We offer volume discounts to Optical Stores that would like to provide their clients with an option for repairing / fixing their broken eyeglasses. This gives you the opportunity to make a client very happy and at the same time providing some additional revenue for your Optical business. Please contact Mike or Tim at 608-833-4500 to find out how to set up your account today. 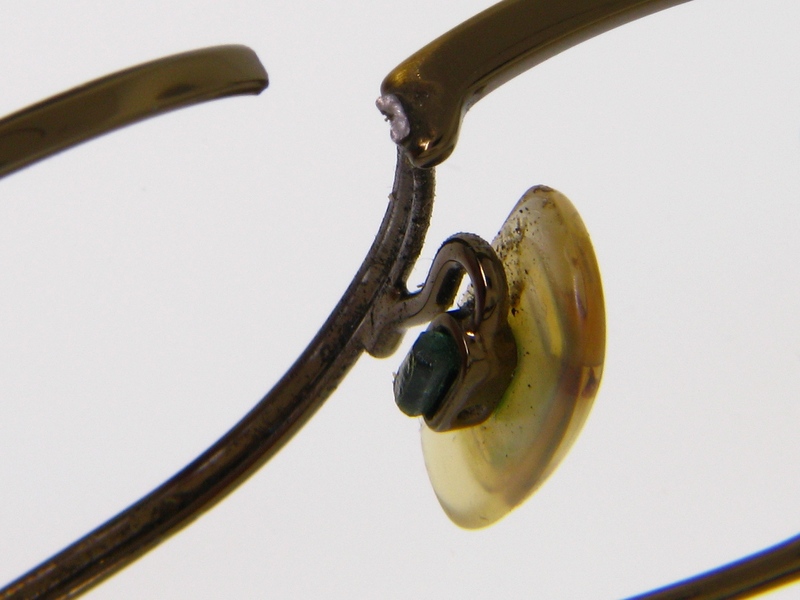 All eyeglasses are repaired within 24 hours and returned to you with FREE SHIPPING.